All information about a skin is stored in a .skin or a .skin7 file (the .skin7 files are for use by the Windows 7 style). The skin files must be installed in the Skins directory of Classic Shell (for example C:\Program Files\Classic Shell\Skins). The skin file is a DLL that contains specific resources like bitmaps, icons, etc. The only mandatory resource is a text resource with ID=1 and type="SKIN". It is the text that describes the skin. The description can refer to other resources like bitmaps and icons. A great feature of Resource Hacker is that it lets you edit the text directly inside. When you are done, press the "Compile Script" button, then save the file. Note: Keep in mind that often the Skins folder is protected by the OS. If you want to use a tool to edit a file directly in that folder, the tool must be started as Administrator. To replace a bitmap resource, select Action -> Replace Bitmap. 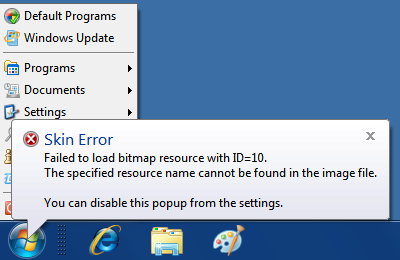 Then pick your new bitmap file, pick the ID of the bitmap resource you want to replace, click Replace and save. You can replace an icon resource in a similar way. To add a new bitmap, select Action -> Add a new Resource. Pick the new bitmap file, enter a new name (must be a number), and you can leave the language blank. Finally click Add Resource and save. You can use BMP, PNG and JPG images as resources. Put BMP files into the BITMAP resource section. Put PNG and JPG files into the IMAGE resource section. The menu will first search the BITMAP section for the given resource index, and then the IMAGE section. BMP and PNG images can have alpha channels to support transparency. JPG images are always opaque, and of course, of lower quality. 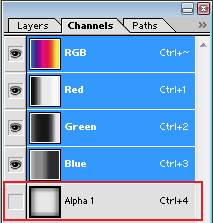 A bitmap can optionally have a color mask. The mask determines how the bitmap is mixed with up to 3 additional colors, called "tint colors". The Red channel of the mask controls how much of the first tint color to mix in, the Green channel controls the second tint color and the Blue channel controls the third tint color. By default the first tint color is the system window (Glass) color, and the second tint color is the menu background color. In this example the first image is the background, the second is the mask and the third is the end result. The red portions of the mask blend the glass color (purple) with the background. The green portions blend the menu color (gray) with the background. By varying the intensity of red and green in the mask image we control how much the colors are blended. The main bitmap can also be a solid color. If both the bitmap and the mask are solid colors, the end result is a solid-color bitmap that is the result of the bitmap color and the tint colors all mixed together according to the mask. If the main bitmap is a solid color and the mask is a bitmap, then the dimensions of the mask bitmap determine the dimensions of the final bitmap. In this case the alpha channel of the mask is used as alpha channel of the result. The masks and tint colors are a powerful system that allows you to achieve a large variation of possibilities without the need for a large number of bitmap resources. For good examples how to use the color tints, look at the Metro skin. See the reference section at the end for the supported bitmaps. Everywhere a solid color is accepted, you can use one of the predefined named colors. The actual color at any given moment will depend on the current Windows settings. Using named colors allows you to create skins that follow the current Windows color scheme. You can see a full list of those system colors in the reference section. The rest of the named colors are only available on Windows 8 and up. They come from the Metro palette, which is a complete set of hundreds of named colors, designed to look good together. 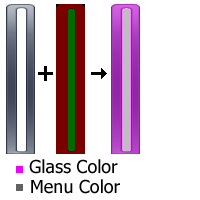 Not all colors are available on all versions of Windows. Windows 8.1 adds new ones that don't exist in Windows 8, and Windows 10 adds even more colors. To make skins that look good on all versions of Windows, you may use a list of colors in order of preference. If the first one is not available, the menu will use the next one in the list. You can get a full list of the Metro colors using the Classic Shell Utility. You can find it on the main Downloads page. For an example how to use the Metro colors, look at the Metro skin. It makes a heavy use of the named colors to achieve look that matches the current color scheme of the start screen. Since many of the start menu elements are not fixed size (they is resized depending on the number of menu items, the font size, etc) and bitmaps are fixed size, we need a way to resize the bitmap to fill a given area. Simply stretching the whole bitmap will not work because fine details around the border will get blurred. Some images can have more than 3 slices. The main menu background has 6 slices - 3 for the caption area and 3 for the menu area. Some images don't need both vertical and horizontal slices. The menu separator image is only split horizontally because all separators have the same height. Not all backgrounds have both X and Y slices. For example horizontal separators only have X, and vertical separators only have Y, since they can only stretch in one direction. See the reference section at the end for the supported backgrounds. where DPI is the current DPI display setting. The font size can be negative or positive. A negative size measures the character height and a positive size measures the cell height of the font. Since the cell is usually taller than a character, a font size -10 is usually slightly larger than 10. The settings that are not specified will come from the "Main" item. See the reference section at the end for the supported items. Now that we know what is a Bitmap, Background and Skin item, we are ready to define the look of the main menu. The main menu can use a solid color for its background or use a bitmap. The color (and all colors in this file) are in the #RRGGBB hexadecimal format. This is the same format that is used by HTML text. The bitmap can be either 24-bit or 32-bit with alpha channel. For region, alpha, glass, fullalpha or fullglass modes there is a limitation where the fully transparent (alpha=0) pixels can be. 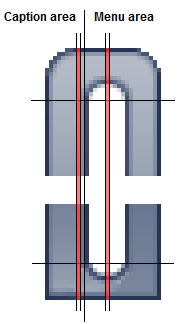 For every horizontal line of the bitmap there can be transparent pixels on the left end and on the right end, but not in the middle. The non-transparent (alpha>0) pixels must be contiguous with no holes. When saving the bmp file make sure you pick the 32-bit file format. The first 3 numbers of Main_bitmap_slices_X relate to the caption area. Set them all to 0 if you don't want caption. If you do want caption, set the numbers to to the left, middle and right slice of the caption area of the bitmap. The second 3 numbers of Main_bitmap_slices_X are for the left, middle, and right slice of the menu area. The 3 numbers of Main_bitmap_slices_Y are for the top, middle and bottom slice of the whole menu. The same numbers are used for the caption and the menu. The highlighted vertical slices are single pixel wide and are stretched to fill the width of the caption area and the menu area. The padding is the number of pixels to leave on each side of the caption text. All Classic skins must support either a single column mode or two-column mode. The Windows 7 skins only support two columns. There is a system option "TWO_COLUMNS", which is set when the skin runs in two-column mode. You may use that option to provide a different bitmap and other settings. For more on options look at the Skin Options section. The main bitmap for two columns must have 6 vertical slices, just like if the menu has a caption. But instead of having a caption section and the menu section, there are the first column section and the second color section. These properties are optional. If something is not set, the values from the first column will be used. Note on separators: For simple separators (with no text) the height of the separator is determined by the height of the provided bitmap. If no separator bitmap is given the menu uses the default etched line. For the complete list see the reference section at the end. The main menu supports overlays of tiled (repeated) textures that are blended with the main background. You can have up to 4 patterns. By default the patterns will cover the entire menu. You can use a mask image to control where the patterns will be visible. The Red channel controls the first pattern, Green controls the second pattern, Blue controls the third pattern and Alpha contols the fourth pattern. 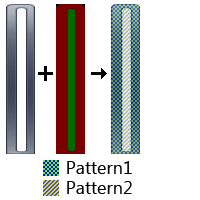 In this example the red areas of the mask are replaced by Pattern1 and the green areas are replaced by Pattern2. The masks must have the same size as the images they correspond - Main_bitmap, Main_bitmap_search, Main_bitmap_jump and Search_background. Note: Having multiple patterns blended together can be slow. For fastest results, try to limit most areas to a single pattern withthe mask at full intensity (100% Red or 100% Blue, etc). If you want to have a semi-transparent pattern, it is more efficient to have the transparency in the alpha channel of the pattern bitmap instead of using half-intensity mask. For an example on using patterns, take a look at the Metallic skin. The main menu background can have additional images drawn on it, called "emblems". They are drawn without any stretching. You can have up to 10 of them. The first 4 can use a mask bitmap to control where in the image the emblems will be visible and where they will be hidden. The horizontal alignment can be left, right or center for the entire menu, left1, right1, center1 for the first column, left2, right2, center2 for the second column, or corner. The corner alignment will align the emblem to the same corner of the screen where the start menu is shown. The certical alignment can be top, bottom, center or corner. The emblem mask controls where the emblems will be visible. Red is for the first emble, Green for the second, and so on. The top half is used for the normal arrow and the bottom half is for the selected arrow. The top 2 point up, the bottom 2 point down, the left 2 are normal and the right 2 are selected. Tweak the numbers to get the desired alignment of the caption, or the gap between the icon and the text, etc. The frame is drawn on top of the user picture, so it must have a hole where the picture is supposed to be. That means the frame bitmap must have alpha channel. The Windows 7 style shows the user picture as a separate window that can extend beyond the size of the start menu. The user image is restricted to 48x48 pixels and the frame around it is always 64x64 pixels. This limitation is because the size must match the size of the extra-large icons used by the items in the second column of the menu. The four number are the left, top, right and bottom offsets of the rectangle. Positive numbers mean offsets from the left and top. Negative numbers mean offsets from the right and bottom. In this example the rectangle will be 10 pixels from the left, 15 from the top, 75 from the right and the bottom will be 55 from the top. Since the top and bottom numbers (second and fourth) are both positive, the rectangle will be aligned to the top of the menu and will always be 40 pixels tall. Unlike other fonts in the skin, the font for the user name does not scale when the screen DPI changes. Read more about font scaling in the Scaling section below. The alignment can be center, center1, center2, left, left1, left2, right, right1 or right2. If this setting is missing, the name is centered by default. Center, left and right align the name relative to the whole menu. Center1, left1 and right1 align inside the first column, and center2, left2 and right2 align inside the second column. The user name is usually taken from the system. For systems that provide full name it will be something like "Smith, John". Otherwise it will be the login name like "jsmith". You can override the text from the settings, using the User name text setting in the Menu Look tab. The Windows 7 style (the .skin7 skins) have some additional requirements for the main menu. First, it requires 3 separate backgrounds to be set, Main_bitmap (as shown above), Main_bitmap_search (used during search) and Main_bitmap_jump (used when a jumplist is opened). 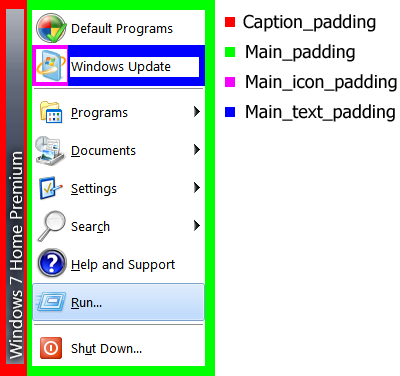 It is recommended that the top and bottom padding for all 3 backgrounds are the same, otherwise the menu items may move around as the menu transitions between different modes. Second, the skin needs some new skin items to be defined, like Shutdown, List, Programs, etc. For the complete list see the reference section at the end. There are some additional bitmap resources that need to be defined, also listed in the reference section. These include the background around the search box in various modes, custom pin icon, etc. In the settings of the start menu there is a button About This Skin that opens a message box. Use it to provide information about the skin and about yourself. List any requirements of your skin - Does it require Aero? Is it intended for Vista only? In the text you can use \n as a line break, like "Line1\nLine2". The text also supports hyperlinks in the format <A HREF="www.mycoolsite.com">Visit my site</A>. The icon can be any icon resource you want displayed. If no icon is provided, the system "info" icon is used. Variation1=0, "Large Icons, With Caption"
Variation2=2, "Large Icons, No Caption"
Each variation has a resource ID and a text. The ID refers to a secondary SKIN resource, which contains overrides for some parameters (for example an alternative Main_bitmap, or Submenu_font). The text is the name of the skin variation that will be used in the Settings box. The skin variations make it possible to pack multiple skins into one file, which makes them easier to distribute together. 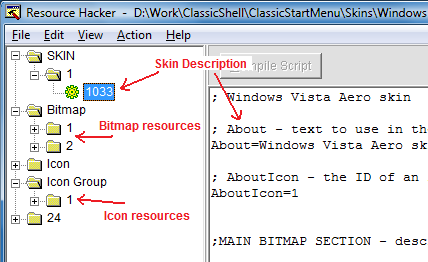 Also all skins can share bitmap resources from the skin file, reducing the total size. First there is the word OPTION, then the name of the option (like CAPTION), then the label for the checkbox (like "Caption") and finally the default value (1 - ON, 0 - OFF). At the end of the skin file you can have one or more sections that provide overrides for some parameters. Each section has a condition, which is evaluated based on the options that the user has selected. The condition can be an expression that uses operations like AND, OR and NOT - like OPTION1 AND (OPTION2 OR NOT OPTION3). Each section starts from its header and ends at the next section or the end of the file. So it is important to place the sections at the very end of the file. The "Center user name" option will be disabled when USER_NAME is false (that is, when the "Show user name" option is unchecked). When the option is disabled, its value will be fixed to 0. The idea is to make it clear for the user that if you don't show the user name then you can't center it. Important Note: An option can only depend on other options that are defined before it. So in this example USER_NAME must be defined after CENTER_NAME. More complex options can have an actual value in addition to being turned ON or OFF. The value can be a number, a text string, a color or an image. This defines a color option named COLOR_CUSTOM. The default value is FFFFFF. The condition for the option is TRUE, which makes it always enabled. The option will be displayed as a checkbox and a color picker. When the checkbox is clicked, the value COLOR_CUSTOM will become true, which will enable the [COLOR_CUSTOM] section. The actual color value selected by the user will replace @COLOR_CUSTOM@. For number, text, or image options, use OPTION_NUMBER, OPTION_STRING and OPTION_IMAGE. Check out the Metallic skin for many examples of complex options. The classic skins (the ones stored in .skin files) can be used in 3 modes - "one column", "two columns" and "all programs". The first and the second are used depending on the current menu style. The last one is used on Windows 7 to show the All Programs sub-menu of the Windows start menu. Not all options make sense in all modes, so it is nice to hide them from the user. For example the caption settings can't be used in "two columns" mode, and any main menu settings are ignored in "all programs" mode. The first option in the list defines the group. It has a name, then the value (which is ignored), then the list of the possible options. The next few options define the possible selections. Exactly one of them must be set to 1 and that will be the default selection. When the user clicks on one of the options the rest will be set to 0 automatically. Then the full 25% increase will be applied, so 8 will become 10 and 10 will become 12.5 (rounded to 13). In this case the first and third number will be scaled by 100% and the rest will not be scaled. Not all skin parameters support scaling. 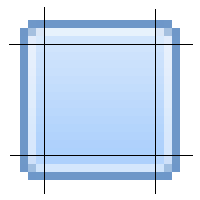 For example bitmap slices cannot be scaled because they represent portions of some bitmap resource. The parameters that can be scaled are marked as such in the reference section. This will make the Main_font scale with half of the rate of the DPI increase. Note: One exception is the User_font. It is not scaled by default because it is intended to fit in the User_name_position box. If you want the font to scale, you should use the same scale for the user name position. When the DPI is 144 or higher (text size 150% and up), the skin defines a setting HIGH_DPI, which allows you to provide alternative bitmap resources and other parameters that are intended to be used with higher resolutions. Use it for example to define larger graphical elements like arrows and icons. #7014 means to look up string number #7014 in the DLL. Custom skins can use the strings that already exist in the DLL, but unfortunately new strings cannot be added by the skin itself. The file name must be the resource ID of that asset in the skin file. For example 12.bmp will go into a bitmap resource with ID 12. Edit them until you are ready to package them into a skin file. The "Custom" skin option is available in the settings only if the start menu can find the 1.txt file. This makes the start menu run in right-to-left mode. Use it to see how your background image will look on an Arabic OS. Note: The RTL emulation is not perfect. One notable difference is that all menu icons are mirrored. On a real RTL Windows they will not be. If your skin is causing an error, the start menu will drop it and use the Default skin instead. The reason can range from a missing resource to an incompatible version to a bitmap with wrong size, and so on. Note that only errors related to the current skin variation and the current skin options will be reported. So test your skin with every combination to ensure it works in all conditions. This section describes all possible settings that can be used in a skin file. Before we can define the individual settings we need to define the types that a setting can have. A setting can be one of the following types: text, number (or multiple numbers), color (or multiple colors), font, icon, bitmap, background or skin item. Some settings like background or skin item have multiple sub-settings described below. The names of the sub-settings begin with the name of the parent setting. For Windows 8 and later you can use many more named colors from the Metro palette. Use the Classic Shell Utility to view the full list. A background is a bitmap that can be resized to the necessary size. It consists of a bitmap resource and slice numbers. The number of slices depends on the actual background. Some are 3x3, some are 3x1, some 6x3. A skin item controls the complete look for individual menu elements. It sets the font, colors, and other settings. User_frame_position 2 values (with scale) The horizontal and vertical position of the frame. The horizontal can be also "center", "center1", or "center2"
Classic Shell © 2010-2015, Ivo Beltchev.